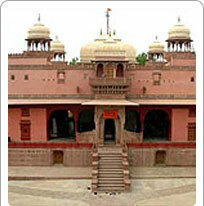 The Shiv Bari Temple is among the various attractions of the holiday destination Bikaner. Built by Maharaja Doongar Singh, it is made of red sandstone that is quite popular in the architecture of this region. The unique aspect of this temple is that it is fortified by a huge embattlement wall. The temple has two water reservoirs with lattice work and numerous domes, columns and pavilions. It has a four-faced black marble Shiva statue and a bronze Nandi facing the Shiva-Lingam. The temple is located a mere six kilometres from the main city and is well worth a visit.